Pre-travel research about the necessary permits, visas and Forex requirements is always a daunting task for most travelers. During my recent motorbiking journey to Bhutan, I had difficulty in finding information on web which was written from a travelers perspective. I just had to come up with an exhaustive guide which was written keeping in mind the questions of a traveler. Entry into the Phuentsholing border is open for Indian vehicles, however, in order to go beyond you have to get permits. If you are travelling by your vehicle, you need two permits, one for yourself and another for your vehicle. Note: All the travelers may not be present in person to get permits. One person can apply for all. A permit for individual traveler looks like this. This is what the vehicle permit issued by RSTA looks like. 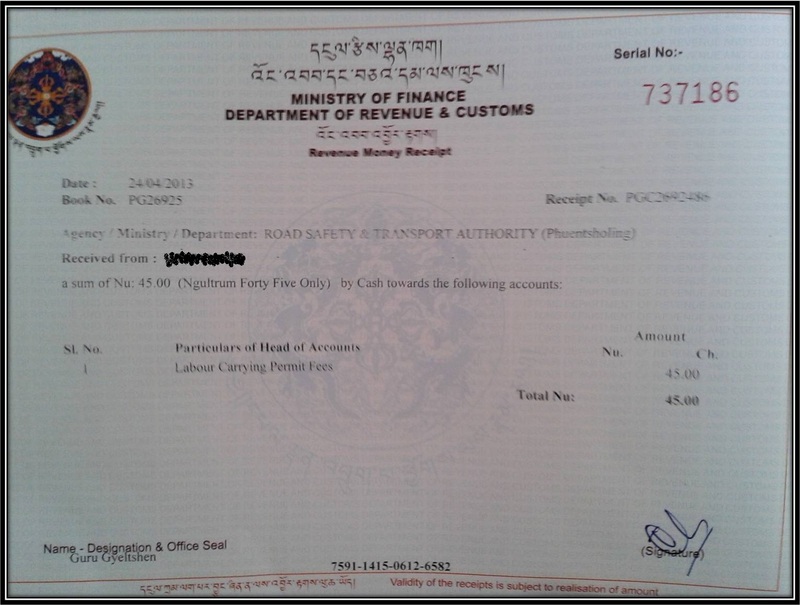 You will need to show the vehicle and travelers permit at two checkpoints between Phuentsholing and Paro/ Thimphu. You have to deposit the permit back at the last checkpoint on your way back. 3. These permits are applicable only for Thimphu and Paro. 4. Permits for Haa Valley, regions beyond Thimphu and permit extensions can only be applied for at Thimphu immigration office. The processing takes one day. I hope I have answered all the question in one article. If there are any suggestions that you have or if you noticed any changes in the process recently, please let us know in comments below. so both the permit can be done in one day? and how much time it will take to get both the permit? is it the same office for both? if not, where is the vehicle permit office? Yes. Both the permits can be done in a day provided you are ready with all the documents and cross the border before 12 noon atleast. RSTA office is different but not far from immigration office. Just ask anyone around. 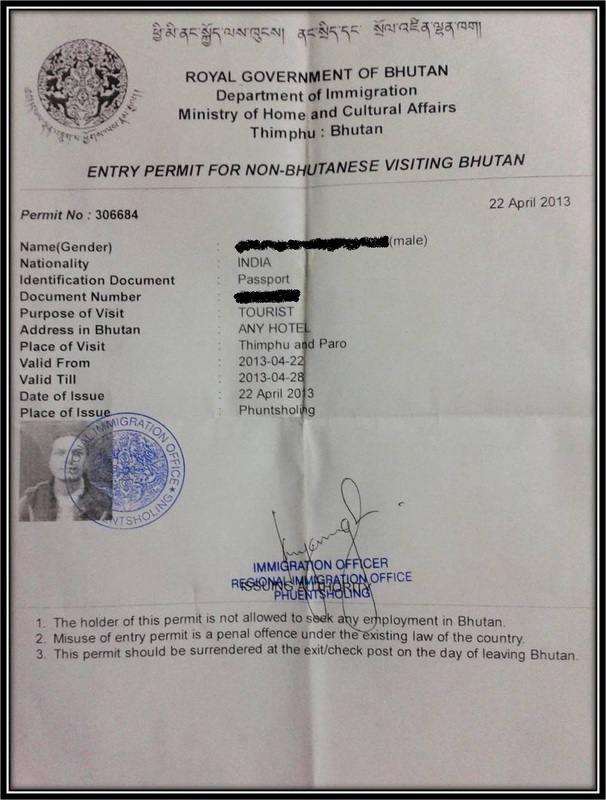 What are the permission needed for a regular tourist, not by road, I'm staying at Mumbai and wish to see Bhutan..
hi is the entry permit office open on Saturday and Sunday ? I've got same question, Is it open on Saturday/Sunday? Also, if not, A friend can reach on border town on friday morning, can he get permit for rest of people if we give him all the documents? Hi, Do children below 10 years also need passport to visit Bhutan? My both kids passport are expired (as for kids the passport is valid only for 5 years). Can I travel with my kids expired passport? if not, any other document that can work for my kids? You can take any valid identity proof like PAN card etc. However, it is recommended that you take passport as that is the most trusted form of ID. If your children do not have passport, I think you can carry any form of ID for them and the authorities should be able to give you permits based on their parents' IDs. They wouldn't stop small children on border would they? 🙂 That would be stupid of them especially since the children are minor. Did I answer all your questions? Hi Harshit, I am sorry I couldn't respond to you in time. I hope you were able to travel to Bhutan conveniently. Hi Jeetu, Apologies I couldn't respond to you on time. Hope you were able to travel to Bhutan safely. Thank you so much for your response! Yes, this should help. Infact while searching more, I found on one website that the kids can travel with adults with birth certificate and school ID (no need for passport for kids). So if that's the case, we should be good for the trip with kids to Bhutan! What is the minimum size of the group for getting a permit? Hi, am a solo Indian traveler, and I wish to randomly backpack across the country for about a month, with no fixed itinerary, is it possible ? what are the permissions I would require ? Hello. Solo travel across Bhutan without a plan is a great idea. You would need two permits in Phuentsholing (one for yourself and another one for your vehicle if you are driving). These permits will allow you to enter Paro, Thimphu and Dochula Pass. If you want to go to Punakha or Ha Valley, you need separate permits from Thimphu which will take one full day to process. will be in bhutan in april 25th to 29th.can u sujjest some hotels of budgeted style. i am solo traveller on a motorcycle. prefer rooms costing rs 500/day. Hi, you needn't worry about hotels. There are many in Phuentsholing, Paro and Thimphu within that budget. If you have a bike, you can easily drive around and explore different hotels. I really do not think that you need a recommendation for that because even I explored after I reached. gaurav, the same question above- sat/sun open or not. thanks for the reply on the hotel ……. Hey Gaurav, I stumbled upon your portal while reading about Bhutan and I have been reading other posts too. Glad to see that you are able to travel the way you wanted and able to make a living too. I have a question too which will help me and may be others. Most of the resources speek about the 200 – 250 USD minimum payment for travel. But I am also seeing INR 500 stay per day etc. Generally we are backpackers and prefer to meet the road as it is and travel with minimal planning. I hope that is possible ? We can probably book a base location and then plan the rest after reaching say, the capital if we are OK with spending 1 – 2 days roaming around making enquiries etc ? Is there a way to book a Kolkatta to Paro flight? Hi Roshni. Bhutan airlines and Druk Air run morning flights from Kolkata to Paro. Check their website to book. USD 250 per day is not applicable for India and Bangladesh people. It is only for other countries from Europe, US etc. Indians can go and take permit and spend as they like according to their pocket. If you are an Indian, you needn't worry about spending so much. Hi Gaurav, it possible to get a permit on saturday/sunday from phuentsholing? I am planning to visit Bhutan in 2 months. Hi Neeti. It is better that you plan in such a way that you reach Phuentsholing on Friday morning. It is a government office and will be closed on Saturday & Sunday (although I am not sure). Still do not take a chance. thanks. Will consider reaching early. I inquired with Phuentsholing hotels and they say permit office is closed on Saturday, Sunday and all govt. holidays. So please plan accordingly.